In addition to the totaled quantities available on the Cumulators sheet and the Cost Outputs sheet, the Energy Policy Simulator (EPS) calculates numerous other outputs that are useful for understanding the full range of impacts of the modeled policy package. A variety of these outputs are available on this sheet. In this section, the model estimates the impact that changes in fuel prices (as a result of the user’s policy package) will have on pollutant emissions and on GDP. Note that this is not a holistic measure of the impacts of the policy package on GDP because many policies would affect GDP positively or negatively in ways other than by affecting fuel prices. 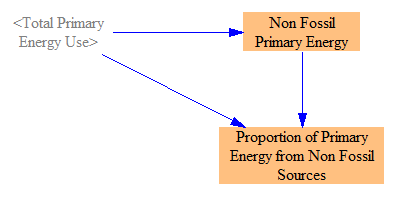 However, as the model only looks at first-order economic effects (as discussed above), and these GDP impacts would require the consideration of second-order and higher-order economic effects (including questions such as what the government does with increased tax revenue), the model is not equipped to make calculations on policy packages’ overall effects on GDP. Next, we calculate the change in pollutant emissions due to the change in GDP. Ordinarily, the model calculates pollutant changes in a detailed, sector-by-sector manner. However, we do not know which sectors are responsible for the observed change in GDP, so we simply use economy-wide metrics here. We do not use the GDP-adjusted variables in other model equations, nor do we include them on the Web Application Support Variables tab. This is because, as noted above, we are not accounting for all of the policy package’s effects on GDP when determining the change in GDP. We are only looking at the effect of changes in fuel prices on GDP. Therefore, the outputs such as change in pollutants due to changes in GDP are similarly incomplete. This structure primarily exists in the model to be ready to support future model extensions that might refine the “change in GDP” calculation to include more policy effects. 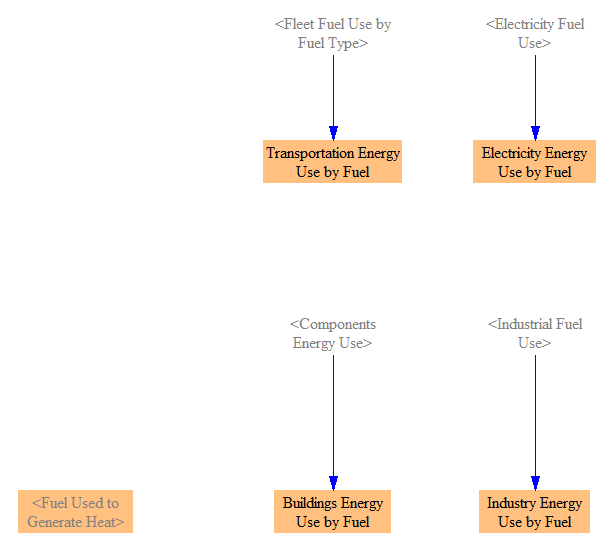 Some users might want to know the amount of emissions from the production of energy (in any form, such as heat, electricity, light, or force). 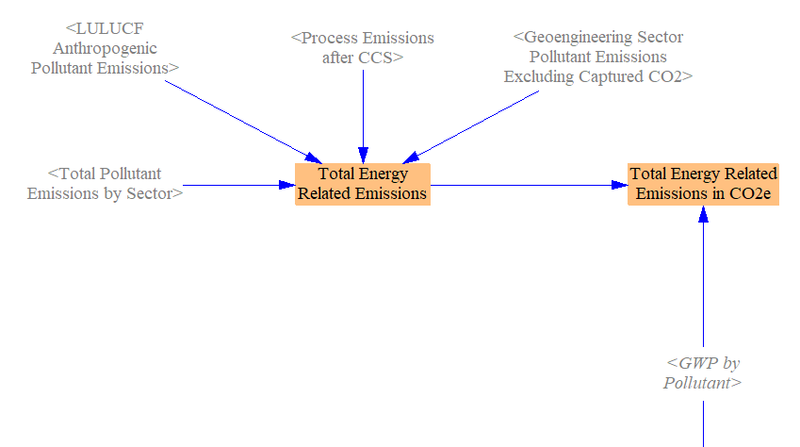 All emissions in the Energy Policy Simulator (EPS) are “energy-related” except industrial sector process emissions and anthropogenic LULUCF emissions. We include the effects of carbon sequestration, so sequestered CO2 is removed from the total emissions reported here. 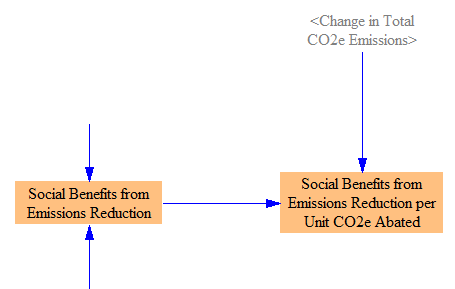 This section contains a variety of outputs that may be of use for scenario analysis. 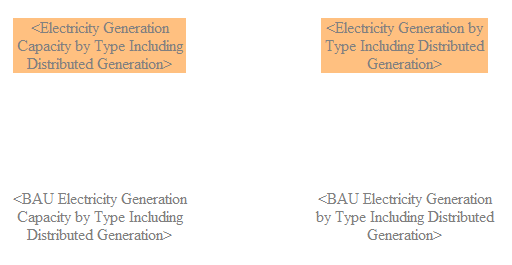 These outputs need little calculation structure (or in some cases, they are simply shadow variables from elsewhere), so they do not merit their own sections on the “Additional Outputs” sheet. There is also a “Zero Line for Graphs” variable in this section. Its value is always zero. It exists so that a line along the X-axis can be drawn on certain graphs in Vensim, which improves their appearance. It has nothing to do with graphs that appear in the web application interface. In the United States, the EPA released a “Clean Power Plan” that specifies particular emissions targets that must be met by the electricity sector. The plan was released after the release of our BAU input data, and so compliance with the plan is not part of the BAU case. 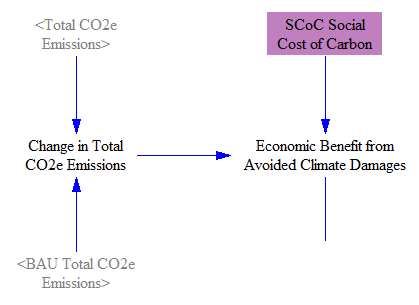 This structure provides a simple, quick way to test whether a user-generated scenario (in the policy case) meets the Clean Power Plan emissions targets.